You convinced me an Atlas V launcher can easily be done with Multistage. Ok, here is the result. The config-files are from Jim Clem's original Atlas V, the meshes are from Brian's LRO mission (I like the frosty white look of the tank ). Named the launcher Atlas V N22 (N for No fairing). The only slight drawback is the Centaur mesh shows only a single engine, but 2 flames. Maybe will give that an overhaul later. The zip-file has been updated. Fred: Yes, the CST capsule is live! You can see on the screenshot it just jettisoned its aerodynamic skirts. Thanks for your great work on Multistage2015! Thank you for all you hard work in making it happen. If I may ask of you to release a sen. with the Atlas V . I would greatly appreciate it when you have the time. 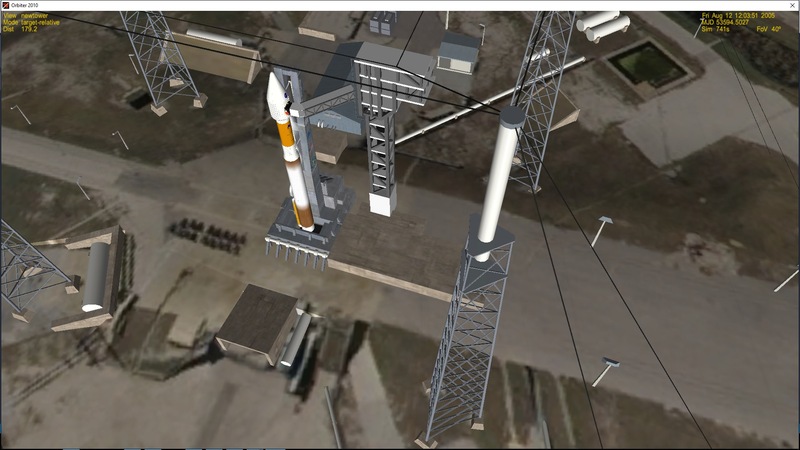 In the current version 03 an Atlas V scenario is already included (CST launch on AtlasV.scn). Just download the CST-100-02.zip on the frontpage of this thread. Ah, sorry, I did not modify the pad. I just placed the launcher at pad 39. Actually I do not know how the access tower will look like, and it is not really in my focus. Version 03 can be downloaded on the front page. It is a 'beautification update' with new textures for engine exhausts, chutes and airbags. Long time ago I did the exhausts for the Delta IV and tried to replicate this for a kerosene exhaust. Made a very basic double engine Centaur out of BrianJ's orignal mesh. Played a little with the possibilities of Multistage2015. This addon is amazing! Please report if the engine exhaust particles would cause an unacceptable frame rate drop. The only minor thing I'd suggest: The Atlas V launches from SLC-40, not LC-39A. Beyond that, it looks great! Thanks for everything. I had a go at making an AtlasV launch from LC-41 scenario. You will need LRO or MRO add-on installed (for pad LC-41) and CST-100 v.03. Includes a new AtlasV "AVN23-CST.ini" with modified "cog" parameter, and scenario "CST launch LC41 AtlasV.scn" in CST-100 folder. Thank you Brian! Your LC41 looks fantastic! Sadly there are no flight data files for the spacecraft yet. This is very true! Actually I never found so little data on a near-future spacecraft. Boeing is keeping it confidential. Even Astronautix and Gunters Space page say "~13000 kg". Everything else is estimated guessing.